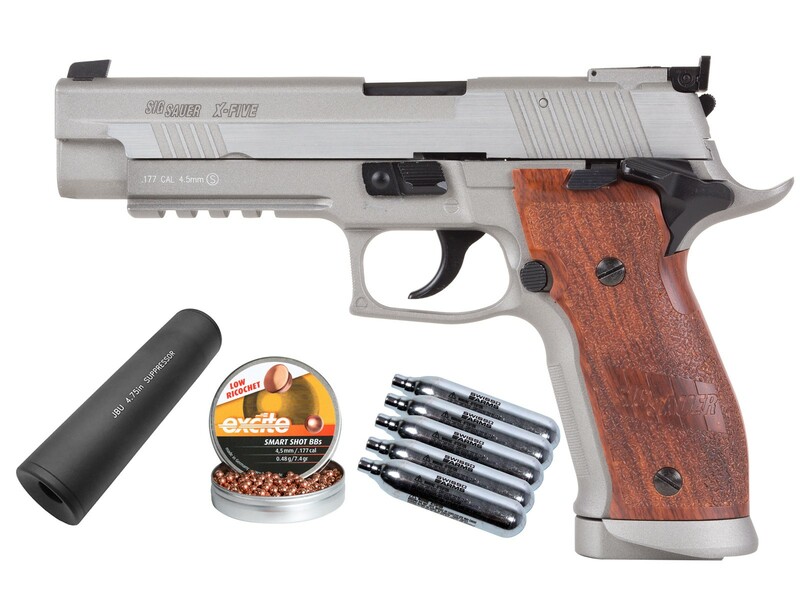 This officially licensed replica air pistol features the Sig Sauer name right across its full-metal slide that blows back every time you pull the trigger. The blowback feature, as well as the full-metal construction, really infuse a sense of realism to your shooting sessions. Add your own accessories to the Weaver/Picatinny mount to customize this pistol to your preferences. An update of an earlier X-Five air pistol, this 226 X-Five features an updated adjustable rear sight--a great asset to ensure well-placed shots. To use, simply load up a 12-gram CO2 cartridge and 18 BBs to send them downrange at 300 fps. Things I liked: Wow - I am surprised there are not more reviews for this excellent pistol. Out of the 9 Co2 pistols I own, This is far and away one of my most favorite ones! It has great recoil, reasonable gas management, is all-metal, near perfect match in terms of weight to the original, and is very well-executed in fit & finish. Too bad replacement grips are so expensive! What others should know: The slide sometimes sticks back. be patient and don't force it - it will work correctly with a soft touch. Things I liked: Very, very nice metal work and overall look and heft. The adjustable rear sight is an excellent addition, wish all other pistols in this price range would offer this. Very accurate after sighting in at 20 - 30 feet. I purchased the $10 'check-out' mainly to verify there was no leakage as some reviewers mentioned. It also chronied in excess of 345 fps during testing at pyramyd. Things I would have changed: DEFINITELY change grips to wood. The plastic grips severely cheapen both the looks and feel of this pistol. Secondly, make additional like magazines available for purchase. 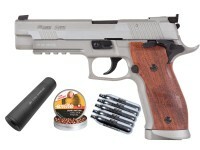 Can the grips be replaced with grips made for the live fire P226? Where can I purchase a CO2 cap for this magazine? And/or magazine like the original? Is this field strip capable?